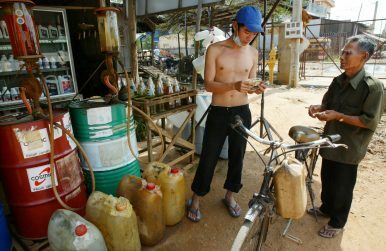 A gasoline vendor, center, counts money as a man, right, paid him for three liters of gasoline at a road-side store on the outskirt of Phnom Penh, Cambodia, Oct. 30, 2006. A new set of international companies are optimistic about Cambodia’s nascent oil and gas industry, but they are investing in an extractive business that has proven costly and yielded only delays, not yet profit. The Canadian-listed gold mining company Angkor Gold announced this year that it would start exploring oil and gas blocks onshore in Cambodia, expanding out from its gold and copper endeavors which have yet to deliver any profit for the company. Angkor Gold would not disclose any details on which location they may choose to explore, but their website explains the company is negotiating with the government for 7,000 square kilometers, with particular interest in the Kampong Som basin, an area southwest of Phnom Penh where thermal conditions indicate a possibility for oil or dry gas. The exploration comes off the back of KrisEnergy’s pledge to extract Cambodia’s first drops of oil later this year. The Singapore-based oil and gas company announced that it would begin production in 2019 from a reserve holding an estimated 400 million barrels. If successful, they will finally reap the long-awaited rewards of a reserve that’s stymied oil-and-gas giant Chevron for more than a decade, and perhaps turn around the company’s piling net losses and declining stock performance. Among KrisEnergy’s explorations in the region, the publicly-traded company has deferred its exploration where it could, due to downturns in the commodity cycle and volatile oil prices. The company’s 2018 unaudited capital expenditure was at $56.3 million, down from a projected $96.8 million, said KrisEnergy’s VP for Investor Relations and Corporate Communications Tanya Pang in an email. The company relinquished three exploration blocks in 2017 in favor of pursuing the development project in Cambodia’s Block A and other assets off the Thai coast, she continued. In contrast to KrisEnergy’s positive outlook toward Cambodia, the companies exploring onshore and offshore oil and gas reserves in Cambodia have been more likely to pull out of their investment than strike black gold. Onshore explorations have proven particularly difficult. Angkor Gold is the only company that’s currently exploring any of Cambodia’s 19 onshore blocks, but they’re not the first to take interest. Vietnam’s state-owned oil and gas firm PetroVietnam was the previous holder of an exploration license for Block XV – a stretch covering nearly 7,000 sq km just north of the massive Tonle Sap lake. Cheap Sour, director general for the Ministry of Mines and Energy, said the company lost its license due to noncompliance with the government’s contract, without providing any specifics. At the most basic level, the Cambodian government has never conducted an official survey of the land to determine the greatest potential reserves, said Mout Chantheany, social and environmental network coordinator for DPA Cambodia. The nation’s onshore block offerings span almost the entire country, so companies enter oil and gas exploration agreements without specific details on which section could hold the highest potential and embark on a costly endeavor. For Angkor Gold – which is changing its name to Angkor Resources given the exploration – the enabling factor is improved oil prices from five years ago, said John-Paul (JP) Dau, president for Angkor Gold. The company has been eyeing Cambodia’s oil and gas industry for the last five to six years, Dau said, and multiple executives had previous experience in oil and a desire to re-enter the industry. In that same time span, Cambodia’s authority for oil and gas transferred from a separate state entity, the Cambodian National Petroleum Authority, to the Ministry of Mines and Energy, with which was Angkor Resources already familiar from its mineral projects. KrisEnergy is not the first to promise Cambodia oil. Chevron’s local subsidiary once aspired to begin production in 2009 after discovering deposits in Block A in 2004. The company entered the exploration with a 55 percent stake in the investment, with the beleaguered (and now defunct) Cambodian National Petroleum Authority holding a 5 percent stake. When production stalled, Cambodian Prime Minister Hun Sen threatened to take the U.S. company’s license. With production stuck and the company refusing to agree to the Cambodian government’s demand for 70-80 percent of the revenue share, Chevron sold 30 percent of its stake at the end of 2009, and then its remaining 25 percent in 2014, to KrisEnergy. The company sunk more than $160 million into exploration, and reportedly damaged relations with the government, all without extracting a drop of oil, much less any profit. Another high-potential block has been similarly passed between multiple companies. The Singapore-listed Mirach Energy last held the exploration license for Block D through an association with China Petroleum Holdings Limited, but they quietly divested in the company in 2016 after the partnership lost their $7.5 million investment and incurred another $5.1 million in losses, according to their 2017 Annual Report. Mirach could not be reached for comment. Since deals with Chevron, Mirach, and China Petroleum Holdings Limited failed, the Cambodian government’s outlook toward oil has been rosier. At this month’s Extractive Industry Governance Forum the Mine and Energy Ministry signaled they see great potential in Cambodian oil and gas. The lack of legislation and infrastructure put that enthusiasm on edge. A petroleum law that would establish taxation requirements has long been in the making, Chantheany explained, but the government has been slow to jumpstart these efforts since it restructured the presiding ministry after the 2013 national election and changed jurisdiction of the state’s petroleum company. Chantheany said her organization is also concerned that the government has not factored in crucial costs involved in the industry – namely, operations and management as well as how to tamp down contracts when reserves inevitably deplete. The draft law is still underway, and probably slowed by the government’s overarching need to overhaul its taxation structure in a way that adds transparency needed for international business. Dau said Angkor Gold would have to explore first and verify there is even oil or gas in Cambodia before the company could seriously discuss to how share production profits with the government. To Dau, frontier markets like Cambodia are ideal for exploration because investors are less conservative than those in Alberta, Canada, where he entered the industry. Cambodia’s extractive industries have been plagued by illegal mining, over which authorities have slowly tried to gain control. But Dau defends the lax regulation at the moment, which he says allows his company to utilize best practices from Canada without facing increasing restrictions on pipeline drilling that grew as Canada grew into a global player. But revenue share could be a deal-breaker. The company has more than $32 million in accumulated deficit in Cambodia, but Dau said they would have no choice but to pull out if they don’t feel they would make much after production costs. Danielle Keeton-Olsen is a freelance journalist currently based in Phnom Penh. Big data, AI, and digital technologies: Cambodia’s nascent tech sector is blooming. Unlikely Partners: Cambodia and the Eurasian Economic UnionCambodia’s Garment Industry RollercoasterCambodia's Economic OpportunityCambodia's Economic ChallengeWorld’s Most Cutthroat Cell Market?